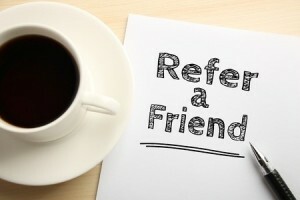 Customer referrals are the most powerful free sales tool available. On average, you have a 20% chance of doing business with a new customer. That jumps to 70% when an existing customer has referred them. They are also a great marketing tool. They are free and can reach potential customers that otherwise would not be aware of you. Indirect referrals are testimonials or recommendations by a customer that potential customers can see. Great on your website or a third party one. A direct referral is where an existing customer has recommended you. They usually give them your contact details. Most people like to help other people (if there is no negative aspect for them). The worst that can happen is that the client says, “No”. What goes around comes around – one of the most powerful ways to get referrals is to give them yourself. Whenever you have the opportunity to refer an associate or bring two contacts together, do so. At networking events, make a point of introducing people to one another. Most people will appreciate the referral, and it may inspire them to respond in kind. Why would someone recommend you?